to hear the silence of all this? In the cavity of your neck I rest. the glass substance of your emotions. like a secret never told. This has been a year of rewarding growth. So much has happened, so many dreams have come true, while others continue to follow me, waiting to unfold, at the right moment. Perhaps a milestone this year has been the solo performance I gave for Dakshina, an evening of classical dance, produced by Akademi and presented at Richmix on April 20th. For Dakshina, I applied for and received, for the very first time, a grant from Arts Council of England. The funding allowed me to present my work accompanied by an excellent group of musicians without whom the performance would not have been the same. Another key highlight of the year has been my involvement with the Odissi Ensemble. After having toured ‘Gods and Mortals’ (2016-17), we embarked in the creation of new work, which was choreographed by Katie Ryan and produced by Kadam. ‘Sacred Shapes’ rehearsals kept me quite busy throughout the year. We began in March with our first creative sessions; we continued in May with the development of the whole work and presented it at Imagine Luton Festival (June), Gateshead Masala Festival (July), Anand Arts Odissi Festival (August) in Bedford. The work was further developed into ‘Sacred Fires’ and presented for a very special show co-produced by Kadam and Walk The Plank for Manchester Diwali Mela (October). This performance was accompanied by exuberant fireworks. Throughout the year, I was also involved in several community projects. From January to June I was Akademi Artist in Residence at West Middlesex Hospital. Here I delivered weekly sessions for patients and relatives, bringing some lightness to the everyday experience of illness. Early in the year, I lead the project Taking Race Live, for which I facilitated weekly interdisciplinary labs with students at Kingston University. In these labs, I used methods of Applied Drama to explore everyday experiences of race and culture. I am now employing a similar methodology in one of the modules I teach at Kingston University, where students use principles of Indian and African dance to create a solo, that explores their stories of migration. In September, I worked, again for Akademi, with a group of HIV positive people for a performance inspired by the exhibition ‘Splendours of the Subcontinent’ and presented at the Queen’s Gallery, Buckingham Palace, on September 17th. This year I have also seen Bhumi Odissi Dance Academy, which I founded in 2017, grow with more courses and more students attending them. I have also continued to be involved, in the development of the Odissi syllabus, which will be eventually ratified by the Imperial Society of Teachers of Dance. The ISTD syllabus project has greatly and positively impacted on my personal development as a teacher, expanding and improving my practice. As part of this process, I have created special exercises, approaches, tasks, and a unique Bhumi methodology, that I plan to share in these coming years. I recently heard, in the movie Karate Kid that: ‘there are no bad students, only bad teachers’. This made me think how important is to be a good teacher, a model for my students, not only as a dancer, but, most importantly, as a human being. As usual, 2018 has been a year rich of training opportunities. In April I travelled to Odisha, thanks to Milap Travelling Fellowship, and spent some time with my Guru Sujata Mohapatra. I also studied with her again in July in Crete. 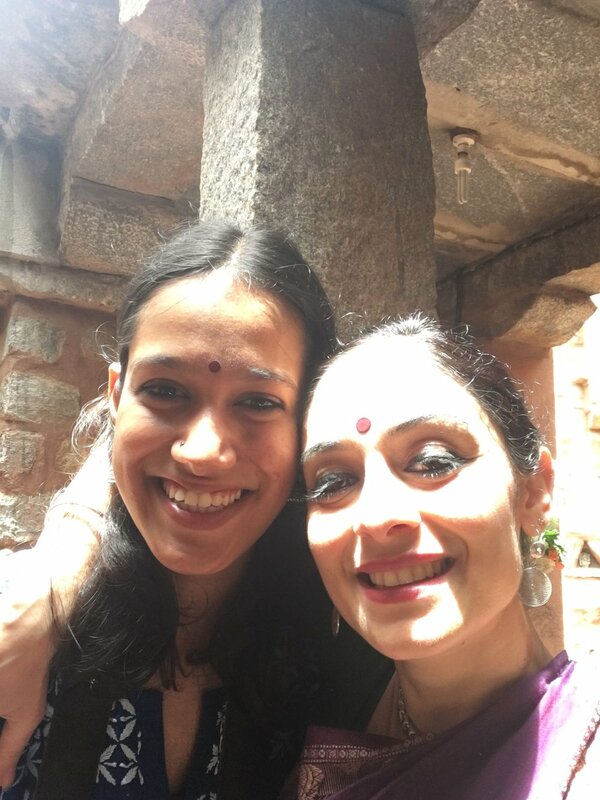 In August I had the privilege of learning from ever-so-inspiring Guru Madhavi Mudghal. In September, I attended the choreolabs by Rama Vaidyanath, organised by Akademi. These have arguably left a huge impact on me. I also attended a Festival of Dance and Poetry in Manchester, during which I had the opportunity to explore the relationship between movements, words, sounds and gestures. In November, I attended an abhinaya seminar by Mavin Khoo. November was actually a blessed month: I had my guru staying at my place and then I assisted her during her preparation for the Darbar Festival performance, presented on the 25th at Sadler’s Wells. This time, among many other things, I learned from her the importance of endurance: ‘do not stop until the work is done’, she told me. Easier to say than to do! 2018 has also been a year of creative collaborations. I had the privilege of working with poet Albert Pellicer, with whom I presented my first solo on poetry on 24th November at Richmix for KU Camarade. In October and November I was also busy with rehearsals and the performance alongside other members of the Odissi collective for Devonshire Square Diwali, presented by Akademi. Finally, I have joined a small group of Indian classical dancers and created a Collective with them. We want to start working together to develop a new methodology for creating new work, through collaboration and peer-mentoring. We have just submitted an ACE Grant for the Arts application and we are waiting to hear results in late January. 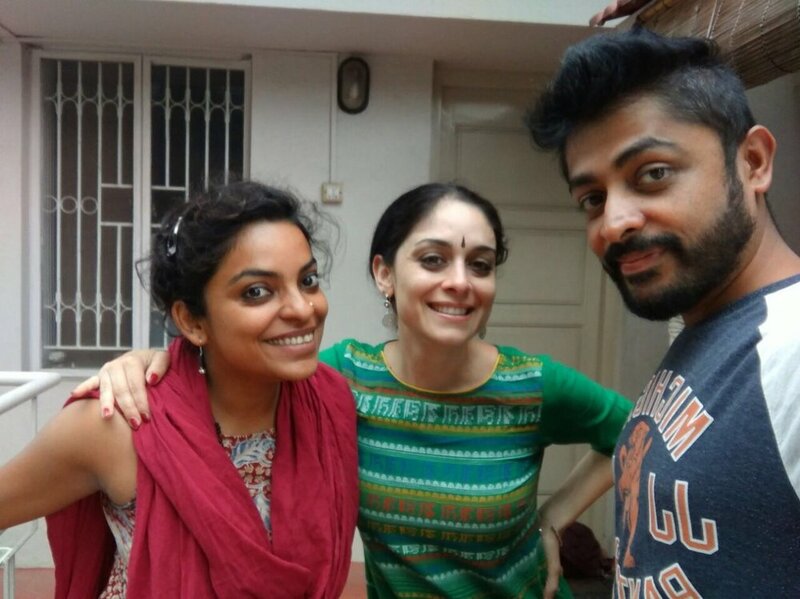 If we are successful, we will present the results of our peer-based creative process on April 5th at The Bhavan. Save the date! I am grateful to have been able to do what I like, and share it with like-minded people. I am lucky to be consistently supported by key organisations and individuals who, by believing in me, motivate me to continue to follow my dreams. Thanks to the Lisa Ullman Travel Scholarship, and further funding received by Gai-Giovani Artisti Italiani and Kingston University, this summer I was able to undertake one of the most enriching experiences of my life as a dancer. I practice Odissi, an Indian classical dance form, which unlike bharatanatyam and kathak is not yet well known and widely practiced in the UK, despite the breadth and depth of its technical vocabulary and choreographic potential. 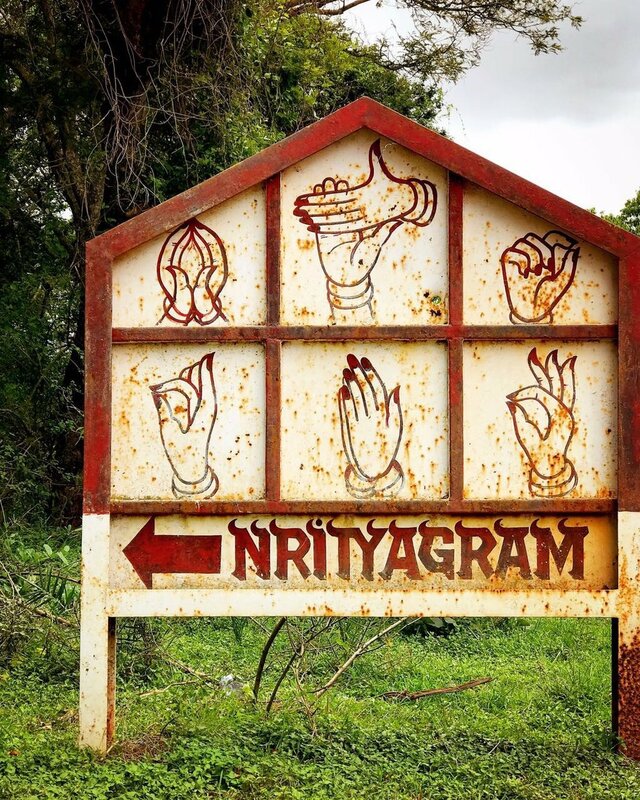 I have carried out most of my training in India under gurus of international acclaim, but it has always been my ambition to study for an intensive period at Nrityagram, a dance village near Bangalore. Nrityagram was founded in 1990 in order to provide unique space where future generations of dancers could focus exclusively on their artistic practice and deepen their understanding of Indian philosophy and performance aesthetics. Nrityagram is presently home to some of the finest odissi dancers in the world, who have electrified audiences both in India and abroad with their distinctive style and breathtaking choreographies, mainly created by artistic director Surupa Sen. Sen’s choreographic work is know for its contemporary aesthetics which is clearly visible in the use of space, time and dynamics, while holding on traditional themes and symbolism. The result feels simultaneously timeless and continuously fresh, setting Nrityagram Ensemble apart from any other odissi professional company, for their originality and aesthetic appeal. In addition, and as a foundation to this choreographic practice, Bijayini Satpathy, the director of education at Nrityagram, has done extensive practical research on the traditional movement vocabulary, expanding it from within, by deconstructing and reconstructing material found in choreographies created by the revivalists of the style in the first stages of development of odissi as a classical dance form. Bijayini has integrated her study of movement with a thorough investigation of classical texts of the South Asian performing tradition, in particular the Natyasastra. In addition, she has also introduced exercises and principles of Indian martial arts, yoga and western body conditioning and movement techniques in dancers’ training. She has then come out with a pedagogical system, which is highly effective in expanding the potential of the odissi dancing body, in preventing injuries, in giving breath and texture to the movements, in allowing a more versatile ownership of the dance material and in nurturing creativity. 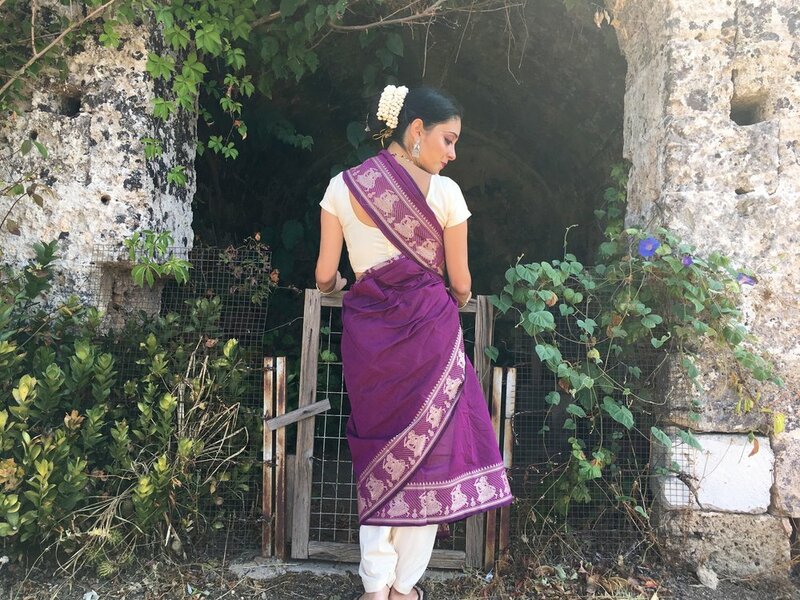 It was therefore essential to me to experience the work of these great artists and to bring it back to the UK where I work as a professional odissi dancer, equally committed to teaching and performing high quality dance. In particular, I was motivated to learn the Nrityagram pedagogical approach, as well as observing their choreographic practice. I wanted also to be exposed to the lifestyle of dancers who are fully dedicated to their art form. While this last point is not immediately translatable to our life as dancers in the West, where financial pressures and a different socio-economical system sometimes prevent us to go in total depth in what we are doing, nevertheless observing these artists at work has been extremely inspirational and has encouraged me to hold confidently on my artistic vision. I will now briefly describe the content of the workshop and then I will discuss what are the key skills, knowledge and general understanding I have acquired. Also, I will mention how I aim to apply this material in my own artistic practice and my vision for the future of odissi in the UK and of myself as an artist, contributing to the professionalization of this dance form. 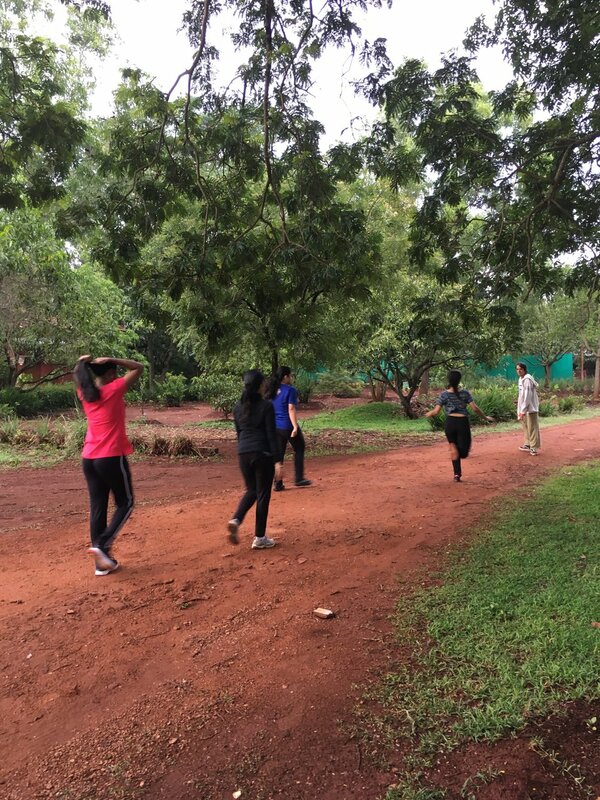 A standard day at Nrityagram starts at 6.00am with a tea and then a gentle jogging in the surrounding countryside, breathing fresh air and pumping oxygen in the body through the simple act of walking. Returning at 7am back to the village, we do our daily chores, such as sweeping common areas or making our own laundry. At 8am, we have our yoga and body-conditioning class, which lasts for an hour and a half. Then we have breakfast. The first dance class is from 10.30am to 12noon, after which we go to observe the Ensemble’s rehearsal. At 2pm, we have delicious vegetarian lunch and, after some rest and a tea, we get back to class from 4.30 to 6.30pm. We have then another hour for personal practice, which we normally use to consolidate what we have learned in class and dinner at 8pm. After that, we are allows to observe the artists teaching the traditional repertoire to residential students. Every single of these moments is an incredible opportunity for learning. Waking up early in the morning gives insights on the degree of daily discipline required in the life of a professional dancer. The yoga and body-conditioning class, far from being an ancillary training, becomes the core of solid and safe practice. In particular, I have learned several exercises that, combining the wisdom of different movement disciplines, are helping me connect with my body and especially with my breath at a deeper level, incredibly enhancing my performance experience and execution. I aim to introduce these exercises also in my teaching as I start my regular classes at The Place and at Kingston University in the next few days. The dance classes were an experience of its own. Normally, odissi training is based on the practice of a few steps and then the study of traditional choreography. However, at Nrityagram, one learns and practices different variations of footwork, steps, including jumps, walks, spins, acquiring a rich palette of movements which can be easily combined and transformed for both teaching and choreographic purposes. This approach, which clearly enhances physical and mental versatility and nurtures creativity, is already a deep source of inspiration for me. I am sure this training methodology will profoundly change my own practice, and will benefiting future generation of dancers who will dance and learn with me. In fact, this approach is also feeding into the development of the odissi syllabus which will be approved by the Imperial Society of Teachers of Dance, and in which I am directly involved. Equally inspiring was the observation of the Ensemble’s daily practice. The amount of work, and the degree of relentless search for perfection, uncompromising commitment and deeply rooted presence in the movement is simply inspirational. The observation of daily rehearsals has also allowed me to have an insight in the way the movement material is worked out and constantly transformed and improved by the choreographer and embodied by the dancers. I had the opportunity to observe the nuanced use of the sound in the footwork, sometimes stronger, sometimes more subtle, the shades in the use of movements, where dancers play with speed and size, and the mesmerizing use of space where the bodies cluster and spread in a constant state of compositional transformation. This understanding of the subtleties of the style will certainly feed into my own creative practice, which I am developing as part of the Odissi Ensemble, a leading performing group presently touring the work Of Gods and Mortals, produced by Kadam/Pulse. Similarly inspiring was observing the teaching of the traditional repertoire. While I have learned many traditional pieces myself, observing the transmission from guru to disciple as an outsider really gave me insights on the degree of endurance and focus both teacher and learner need to have to produce excellence in dance. This awareness will certainly influence my teaching practice as I aim to train the professional dancers of the future. Among the most important things I have learned in this workshop is the idea of finding breath in the movement, of not sparing anything but completing each movement, of finding a moment of rest and release in the stances inspired by temples sculptures, which Odissi is very famous for. I have also learned to constantly feed my imagination, to think about the meaning every single movement has for me and how can that be communicated and translated in its execution. I have learned to ‘wear my eyes’ in different parts of the body. I have certainly expanded my dance vocabulary and refined my performance skills. Finally, it was a unique opportunity to observe how the artists were choreographic short dance sequences on our bodies, combining material learned during the workshop. I feel now much more embodied and grounded as a dancer as I am exploring the texture of each movement. And the feedback I have received on my performance upon my return show that Nritysgram experience is already working in my body. In a more programmatic sense, I want to set up in the months to come my own odissi dance academy to foster excellence in this art form, as well as in the study of ancillary skills and knowledge, such as music, philosophy and aesthetics. I am presently creating a website for this academy and I am looking at publishing it in the next couple of months. As a result of this experience at Nrityagram, I also hope to develop more creative practice, through the collaboration with other visual and sound artists and through choreographic experimentation with the Odissi Ensemble. This has in part already taken place as immediately after the workshop, I worked with a video-maker on a dance shooting in the natural and archaeological landscapes of Hampi, which was a great conclusion to my dance trip to India. I am again very grateful to LUTS, to Movin’Up-Gai, to Kingston University and above all to Nrityagram artists to have made this experience possible at different levels. 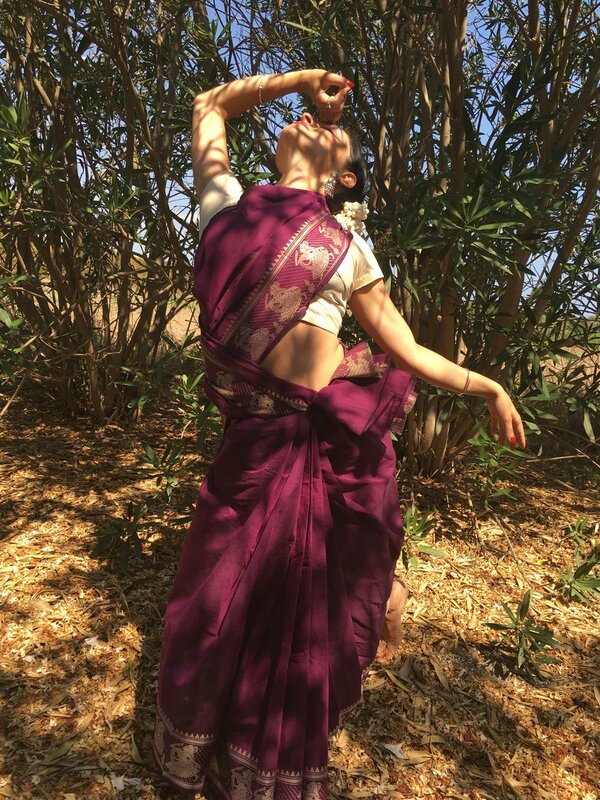 My goal is now to give what I have learned back to people in the UK, through performances, teachings and the active involvement in the shaping of the future of Odissi in this country. What an intense and rich month May has been. As I look back at what I have done, at what I have learned, at the inspiring performances I have watched, I feel really grateful for the opportunities offered to me and rewarded by the efforts I have done so far. May is a curious month, as it marks the end of the academic year and the beginning of the Summer, with its emphasis on personal development and research. It is a month always packed with learning experiences for me, as I enjoy the flexibility given by the end of teaching activities. The month kicked off with two Odissi workshops at Southbank Centre, which I co-led with my dance colleague Katie Ryan. The workshops, which were part of the Alchemy festival, took place on the 1st and 8th and aimed at introducing Odissi to a completely new audience. Teaching Odissi to people who have never been exposed to it, or in general to Indian classical dance, is always exciting but also quite challenging. The first task is offering a session that, while being true to the form and its complexity, is also exciting and able to engage participants in the learning process. Then, the other big task is breaking down all those ‘basic’ skills that can be very difficult for the complete beginner. May has also concluded the Odissi Ensemble Spring Tour as we presented Gods and Mortals at the Hat Factory, Luton, on the 7th and in Sunderland Minster on the 12th. Both performances were extremely successful and we even got a standing ovation. Dancing in Sunderland Minster was particularly magic. I believe sacred places as churches and temples, or even nature itself, provide the most appropriate and fulfilling context to dance Odissi. I also led four Spring Workshops on Odissi Basics in Brixton, which were an opportunity for me to share some of the elements of technique I have learned during my training in Delhi, in particular, khandi, bhramaris, charis and utplavanas. It was lovely to have a small but very dedicated group of students in the studio. And at the end of the month I also gave a Workshop for Toddlers at Southbank Centre, always as part of Alchemy. The workshop was absolute fun as we explored the gaits and movements of Sacred Animals of India! In terms of my own learning, I attended Ileana Citaristi’s workshop, during which she taught a rare composition by guruji, dedicated to Lord Vishnu. I particularly liked the lyrics and the melody of this piece of choreography! I also watched Ileana’s performance at Nerhu Centre and attended her lecture demonstration on the Navarasas at King’s College. Ileana is such an inspiring person and a model of life achievement. On the 26th, I watched the flawless and spectacular performance of Nrityagram at the Royal Festival Hall, which was a true feast for the eyes. What I found inspiring in Nrityagram’s choreography was particularly the excellent use of time, space, dynamics and the enormous physical training that surfaces in every and each of their movements. I can’t wait to be there in a week or so, to imbibe part of their artistry. On the 29th, I attended Choreogata showcase, where again I left incredibly satisfied and inspired. I particularly liked Seeta Patel’s reinterpretation of dance classics, such as the Swan Lake or the Rite of Spring. Equally, the other choreographic scratches left me with fun, nostalgia and sorrow, as they tackled very contrasting issues, such as gender, homelessness, refugee crisis, or life in an Indian urban street. The month ended with the excellent performative lecture of Priya Srinivasan, based on her book Sweating Saris, which is seriously one of the best academic books I have ever read and that I highly recommend as it discusses issues of cultural appropriation and Indian classical dancers as labourer, rather than cultural bearer or nationalist symbols. Well, now I cannot but look forward to my time at Nrityagram Summer Workshop, which I envisage will be a great learning curve for me. I can’t wait to be there and breathe dance morning and night, train, observe, reflect, write, try new things and expand my dance horizons. Watch out for blogs on this amazing experience, made possible by funding coming from different sources (Lisa Ullman Travel Grant, Movin’Up-Giovani Artisti Italian and Staff Development Fund, Kingston University). Duet with Soul/Blouse/Dance sister Maryam Shakiba. Why do I dance Odissi? The more I go into the practice of Odissi the more I find it difficult to answer 'why' I dance in a rational way. I feel that Odissi is the best way life has offered me to connect with my deeper self and deliver my being to the world. I never found this dance, I found myself in this dance. It is challenging. And this challenge reminds me not to fall in the opaque pleasure of comfort. It pokes my physical and mental boundaries. I can feel the universe in me and me in the universe. It is about beauty, unrealistic beauty, not to neglect real worldly beauty, but to be able to abstract the beauty of life within the unfortunate misery of its appearance. And yet my journey is not complete. What can be wings at some point in time, may turn into cage at another. Odissi as my ground. Roots and Water. From the centre I grow. Like a tree. Why should one learn Odissi nowadays? What is the relevance of such deep and demanding art form in a world that is dictated by time efficiency and product oriented logic? Is there a future for this dance and what will this future be? Is there a place for the subtle aesthetic search of psychological unfolding that abhinaya creates, in a world that has lost its desire to imagine the non literal, to decode the symbolic, to accept the uncertain? And the geometrical unnatural beauty of this form, while should one embody it? while should one feel uncomfortable in a world which privileges tedious comfort? We dance this dance as a form of rebellion against the misery of our hectic lives, as a desperate appeal to the deeply transformative power of poetry, as a quest for beauty in a world of horrors. Watch the video of my performance in Cuttack. What most unusual way of ending the year than dancing for the demon king, Kamsa Raja, the supreme enemy of God? Kamsa Raja who heard a divine voice from the sky announcing his death at the hands of Lord Krishna. Kamsa Raja who imprisoned the divine parents Devaki and Vasudeva, after killing six of their sons, to prohibit the birth of his final executioner. Kamsa Raja who sent the ogress Putana to feed with poised breast the little Krishna in the house of his adoptive mother Yasoda. What most unusual thing to know that in Odisha, the land of Jagannatha and one of the main centres of development of Vaishnavism, Kamsa Raja is celebrated and the name of Vishnu is strictly forbidden during the famous festival Dhanu Yatra? What most unusual thing to perform Odissi, a dance that praises Hindu Gods and denigrates the anti-gods, just for Kamsa Raja's delight? Curious to know and see more about this singular tradition, I accepted Sujata’s invitation to perform with her and other students in front of the supreme asura Kamsa Raja in Darbar, where he meets his guests on the New Year Eve. The only deal was that the name of Lord Vishnu and all his forms would not be mentioned, not even by mistake. We left Bhubaneswar at 6.30am on the 31st of December. The journey was long and the train was buzzing with our voices. We spent half of the time discussing what item would have been appropriate to perform. This was not easy to chose considering that most Odissi items mention Vishnu in some of his forms, whether as Krishna, or Rama or Jagannatha. We opted for items dedicated to Ganesha and Shiva and a few pallavi. Sitting in small groups we did mental rehearsal listening to the music on our ipods and following it with our hands, feeling the rest of the movement in our bodies. It is quite incredible how dancers have to train their mind alongside their bodies and how much work they can still do in order to excel in their art just by sitting and purposefully thinking and methodically concentrating on it! I would actually say that the best way to know if you are totally in control of a piece of choreography is to be able to go through it with absolute precision in your mind and by feeling it in the body. If you have a gap in your memory you will immediately realise and know you are not ready yet to perform that item. That said, we reached Bargah Road at around 2pm. Our hosts met us at the station and brought us to their house where we had lunch and full rehearsal with our musicians, Ekalabya and Pradeep. Although we had less than an hour left to our performance and a dim and dull light to make up, we ended up looking absolutely gorgeous in our blue costumes and silver jewellery. We performed on two stages, one for the main Minister of the King and the other for the Great Kamsa Raja himself, with his huge nose and resonating laugh. The most exciting thing was that the king could walk among us while we were dancing. Kamsa Raja was surrounded by his court, which comprised various ministers and a couple of girls fanning his majesty. Both him and his ministers asked us questions, which I did not understand, but in one of this Sujata by mistake mentioned the name of Jagannatha to the immediate reaction of the King who cried loud against the name of the Lord. By looking at these funny characters on stage I thought about the most kitsch Indian TV serials but also about the way we portray demons in our Odissi repertoire, with long and greasy moustache, loud voice, big red eyes, a wrestler body and a harsh attitude. I also thought about previous local forms of rule, which were then incorporated into mythological tales and represented as demonic by the incoming political power. For me the most exciting aspect of all this experience was to dance for someone we normally portray as the supreme enemy of Lord Krishna but also to have the honour to share the stage with my guru Sujata and hearing from her the story of how the evil Kamsa Raja repeatedly attempted, with no effect, to go against his destiny of being killed at the hands of God.